Orlando has done it again! Another fantastic golf course has been added to the area - Sugarloaf Mountain. This is Bill Coore and Ben Creshaw's first design in Florida. It's located 25 miles from downtown Orlando, in Minneola, Florida. This 7057 yd. private course is open for some resort play. 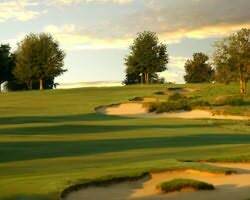 The course is typified by large sandy areas and native grasses. The layout is challenging but very fair. The dramatic elevation changes up to 160 feet are not your typical Florida golf course. The design is very old school and the use of the terrain is fantastic! This is definitely a solid contender for top - 100 Modern status. The course is arrayed in two returning nines - front nine is a huge clockwise loop, back nine forms a looser counter clockwise routing that actually folds back twice to the clubhouse. Lee Janzen, a two time US Open champ says "there is not a bad hole out there, I look forward to playing here again in the future". Once this course fills up its membership, public play will cease to exist. When planning you next golf package to Orlando, please include this golf course in your choices - you won't be dissapointed! If you have interest in playing this golf course - please go to http://www.golfzoo or call 888.333.6103 to book you next tee time. This past weekend I had the opportunity to play at Sugarloaf Mountain for the first time with some friends. We had an absolute blast! The course was in really good condition and we kept having to remind ourselves that we we’re playing a course in Florida. The views are amazing. Their greens were some of the best I’ve played in central Florida lately. Tough but awesome design! This course might be a drive but it is well worth it! We’ll be back soon.